This newsletter template has spaces for filling in class news. Decorated with fall-themed leaves and scarecrow. A book cover and writing practice page to use together or by themselves. Create a report about leaves, write a fall story, etc. 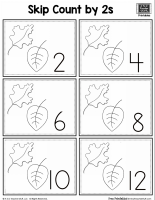 Leaf desk tag in black and white so students can color and customize. Fill in the tree with fingerprint leaves in green, yellow, orange, and brown ink. Three printable books: My Scarecrow Book has pages for drawing pumpkins from 1 to 10. Scarecrow Counting Book has pumpkins pictured and a space for student to fill in the number of pumpkins on each page. Scarecrow Fill in the Missing Number Book has scarecrows from 1 to 15 and one on each page has a number missing. These cute scarecrows can be cut apart for use as puzzles.